Are you struggling with your performing arts studio? Are you wanting it to grow but don’t know where to start? Or maybe your student numbers are dropping rapidly and you don’t know how to bring them back? Do you spend almost every day at your studio, working crazy hours and not seeing any results? Running a dance studio can be exhausting. As the owner, you are probably playing the role of director, teacher, receptionist, administrator, cleaner, bookkeeper, choreographer, manager and more! And with only 24 hours in a day, where will you find time for your family? Your friends? Your SELF? When was the last time you were completely stress-free, fully present in the moment, and not thinking about your studio? What if I told you that it IS possible to run a profitable, successful, and consistently growing dance studio, with less than 20 hours a week? 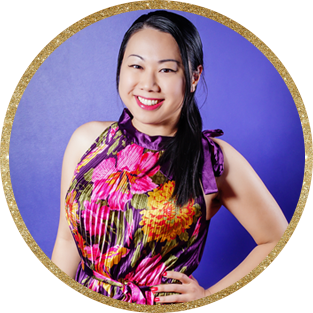 I’m Stella Hui, founder of Dance Studio Excellence and the director of my own performing arts studio in Australia, which I run alongside my fiancé, Cameron. I’ve been in business for over 10 years, and have owned my studio for nearly 6 of those years (and still do). Just like you, I went in with a dream. A passion for dance. A love for the arts that I wanted to share with the rest of the world. In my first 6 months of dance studio ownership, I managed to grow my studio by nearly 250%. The growth was consistent and, before long, we needed more staff, more teachers and more studio space to cater for the demand. By our fourth year, growth had reached over 700% and the studio has never been more alive and successful. Our timetables are full, we have waiting lists for classes, and people traveled for hours to come to our studio (which is unusual in Australia, where we have numerous dance studios in every suburb). You might be thinking that, with this amount of growth, we must have no life! We’re probably at the studio 10 hours a day everyday, right? We go into our studio one day a week. YES, just one day a week we have to set our alarm to go into our “place of work” – which we LOVE – and not because we have to, but because we want to. That is less than 10% of our waking hours combined that we spend at the studio each week. Now, imagine that for yourself. Imagine if you no longer have to teach all of the classes, or take care of all the paperwork, or deal with all the parents. Imagine going into your “place of work” only once a week, or even once a month! Imagine having MORE TIME – time to spend with your family, go out with your kids, see your friends, have a vacation, go for a day spa. Now, that’s not to say that one day a week is the only work you’ll be doing on your business (although it is very possible). 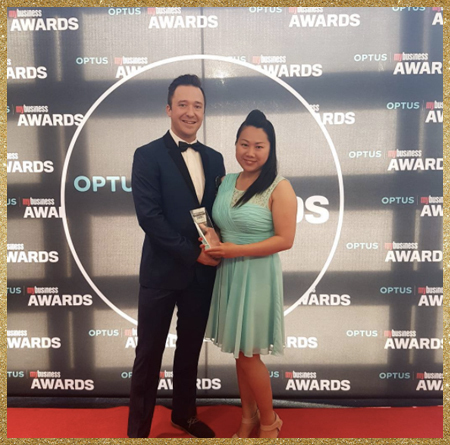 Cameron and I at the 2016 Optus MyBusiness Awards, where I took home the national title of Business Woman of the Year. But you will have the ability to work from home (or anywhere in the world, really), dictate your own hours, and choose the work you want to do. Most importantly, you will have time to work ON your business, not in it. What we do have, is a wealth of knowledge and experience in entrepreneurship and the business of dance and performing arts. We have proven methods that have worked amazingly for us in building multiple successful businesses, not just in dance but also in other industries. 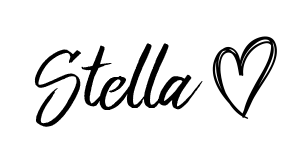 We have a successful, currently-operating studio that allows us to personally experience, case-study and solve the very same problems that you are facing on a daily basis. And most importantly, we have a strong passion to share that knowledge to help other studio owners build successful businesses and achieve the same business freedom that we have.